President Bush tried to devote his news conference at the White House on Wednesday to domestic issues, but he soon found that reporters had foreign policy questions on their minds — many focusing on Iraq or Iran. NPR coverage of President Bush's news conference was hosted by Neal Conan. He was joined by Ron Elving, Senior Washington Editor; Julie Rovner, Science Desk Correspondent; and Jackie Northam, Foreign Desk Correspondent. President Bush on Wednesday urged Turkey not to launch a military offensive against Kurdish rebels in northern Iraq. "We are making it very clear to Turkey that we don't think it is in their interest to send troops into Iraq," the president said at a White House news conference. He spoke shortly before Turkey's parliament approved a possible cross-border offensive. Bush also urged Congress not to anger Turkey, a key ally in the war on Iraq, by approving a resolution labeling as genocide the World War I-era killing of up to 1.5 million Armenians in the final years of the Ottoman Empire. With all the pressing responsibilities facing the nation, "One thing Congress should not be doing is sorting out the historical record of the Ottoman Empire," he said. "Congress has more important work to do than antagonizing an important ally in the Muslim world." During the wide-ranging news conference, Bush accused Congress of dragging its feet on key pieces of legislation, urging quick action on budget and children's health measures. "I think it's their fault that the bills aren't moving," the president said. 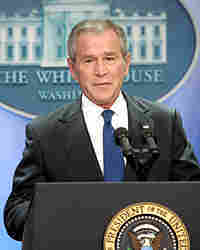 In his opening comments, Bush spoke mainly about domestic issues. But most of the questions from reporters focused on international hot spots, ranging from Iran's nuclear program to the Dalai Lama's controversial visit to the White House to Russian President Vladimir Putin's leadership style. The president said that al-Qaida is weakened but still poses a risk to global security. "Al-Qaida is still dangerous. They're dangerous in Iraq. They're dangerous elsewhere," Bush said. "We're keeping pressure on them all the time." Asked about private security firms operating in Iraq, such as Blackwater, Bush said that studies of their performance need to be completed. But he also voiced support for the work they do. "A firm like Blackwater provides valuable service," Bush said. "They protect people's lives, and I appreciate the service and the sacrifices that Blackwater employees have made"
At times combative and defensive, the president used the news conference - his first since Sept. 20 - to prod the Democratic-controlled Congress to approve spending, education and health bills. It comes just a day before the House will try to override his veto of a bill that would expand funding for SCHIP, a popular children's health program, by $35 million. "It's unlikely that veto override will succeed," Bush said, noting that Democratic leaders knew that "when they sent me the bill." Bush said that he has asked Health and Human Services Secretary Mike Leavitt and other members of his administration to work with Congress to pass a different version of the SCHIP extension bill. Bush also urged Congress to act on mortgage relief for homeowners hit by the housing crisis, on trade deals that would strengthen allies, on legislation expanding U.S. markets and on aid to military veterans. "Congress has little to show for all the time that has gone by" since Democrats gained control in January of both the House and the Senate, Bush said. He brushed aside suggestions that, in the final months of his presidency, he is increasingly powerless to push through important piece of legislation. "There's a lot of unfinished business, and I'm really looking forward to the next 15 months," he said. Bush also defended his decision to attend a ceremony in the Rotunda of the U.S. Capitol later Wednesday to award Congress' highest civilian honor to the Dalai Lama, the exiled spiritual head of Tibet's Buddhists. "One, I admire the Dalai Lama a lot; two, I support religious freedom, he support religious freedom," Bush said, adding that he informed Chinese President Hu Jintao of his plans to meet with the Tibetan leader. Still, the reception the Dalai Lama was getting in the United States infuriated the Chinese government, which reviles the Buddhist leader.